1，Low voltage control panel integrated inside the cutter: the low voltage control panel is integrated into the cutter with "drawer" design, taking full advantage of spare room inside. 2，High voltage control panel: mount the high voltage enclosure inside the cutter, which lay aside the cutter previously, easy for cable connection as a result of appropriate layout. 3，Pneumatic parts layout: mount all pneumatic parts on the back of a steel plate guard on one side of the cutter, easy for adjustment and maintenance. 4，Automatic offset of cutting tool: add two automatic cutting tool offset units, one left and one right on the platform, enhanced effeciency and performance. 5，Appearance design: professionally industrial design appearance, a feast for eyes. 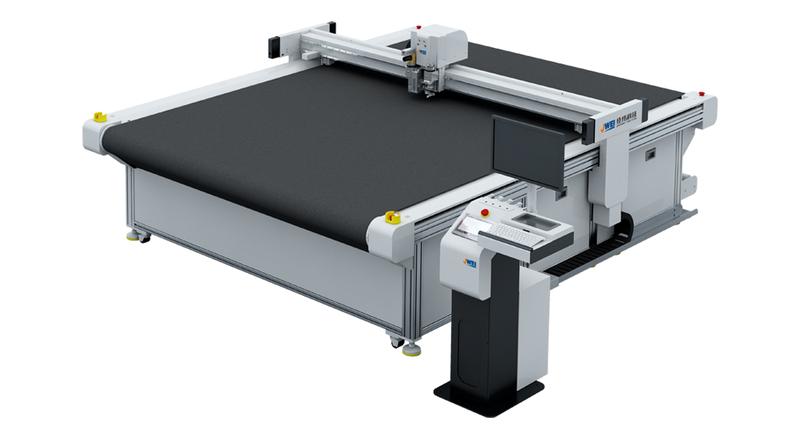 6，Cutting heads: upgrade modules and motors with smaller dimensions and compact appearance. Enhanced rigidity, less weight. Tools of CB08II are compatible with CB03II and CB06II series. Cutting material UV material, outdoor printing fabric, light sheet, gridding cloth, flag fabric, stickers, KT board, PVC expansion sheet, corrugated paper, honey comb board etc.